--Outside Magazine is reporting that, "This is the first year parks have remained open during a government shutdown, thanks to a Department of the Interior contingency plan. There’s a lot of mystery surrounding this new protocol—few know who signed the order in the first place or why it was implemented—but it’s reasonable to assume that the Interior didn’t want to close the parks and risk a PR fiasco like the Obama administration faced in 2013. Now, nearly a month into the latest shutdown, the Trump administration is facing its own PR crisis, with reports of parks—minus most of their full-time staff—getting trashed by visitors and their poop." To read more, click here. --National Geographic is reporting that the Government Shutdown will have a multi-year impact on the National Parks. To read more, click here. --FN is reporting that, "The North Face waded deeper into political territory Saturday with a tweet seemingly designed to troll U.S. President Donald Trump. The outdoor brand said in the tweet that it planned to build free public climbing walls in Atlanta, Chicago, Denver and Brooklyn, N.Y., “as places to unite us.” The message was part of the marketing campaign it launched in 2017 called “Walls Are Meant For Climbing.” To read more, click here. --There is limited information about a skier who suffered a six to seven-hundred foot fall on Mt. Hood over the weekend. It appears that he will make a full recovery and merely suffered a concussion. This information came via Pacific Northwest Mountaineers on Facebook. --KOIN6 is reporting that, "a rescue team brought a climber who got lost on Mt. Hood back to safety after a five hour search and rescue effort. While search and rescue crews said this was an operation where everything went right, 68-year-old Ed Lipscomb still thought he might die on a mountain he'd climbed 182 times before." To read more, click here. --The Jackson Hole News and Guide is reporting that, "A High Mountain Heli-Skiing client was buried in an avalanche Friday while skiing in Vacation Canyon just southeast of Upper Palisades Lake in Idaho. The skier was completely buried for six minutes while guides dug him out, but he walked away with only a few bruises." To read more, click here. --Crystal Mountain Ski Resort is offering free lift tickets to federal employees during the Government Shutdown. Good job Crystal! To read more, click here. --An 80-year-old dentist became lost overnight while snowshoeing last week on the Tahoe Rim Trail. Wendell (Raymond) Murdock states that the reason he became lost was a malfunctioning GPS within his phone. To read more, click here. --Joshua Trees in Joshua Tree National Park have been cut down during the Government Shutdown. To read more, click here. 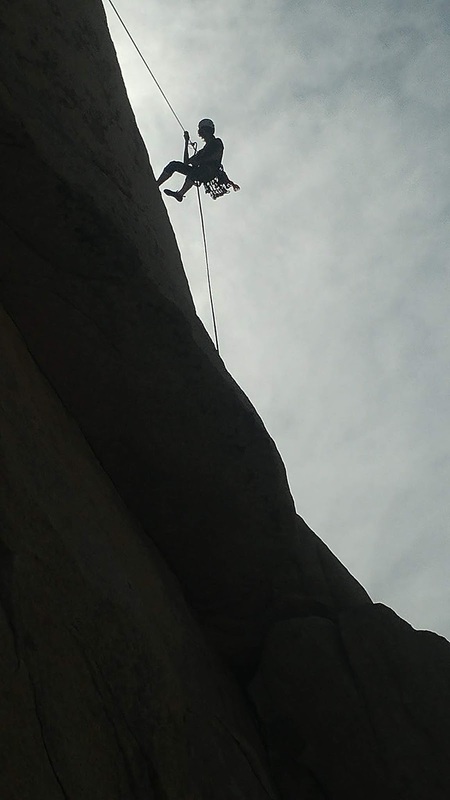 A climber rappelling in Joshua Tree National Park. --The Access Fund is reporting that, "For the first time in nearly 20 years, Joshua Tree National Park is reviewing its climbing management plan (CMP). This world-class area has a long and colorful climbing history and is home to over 10,000 routes and boulder problems within a two to three hour drive of major cities like Los Angeles, San Diego, and Las Vegas—making the future of climbing management a critical issue for the climbing community." To read more, click here. --Think Progress is reporting that, "Federal employees aren’t the only ones nervous about making ends meet during the government shutdown. Hotel and restaurant owners near Joshua Tree National Park say the shutdown has left them without their usual flow of customers and that employees are concerned about paying their bills and making rent." To read more, click here. --The developer says that there will be a smaller footprint than the current Bonnie Springs outside Red Rock Canyon, but this kind of change in such a special place feels dangerous. To read more, click here. --The Las Vegas Review Journal is reporting that, "Nevada’s third tallest peak is a step closer to shedding its Confederate name in favor of something far older and less controversial. The Nevada State Board on Geographic Names voted unanimously Tuesday to recommend a new name for Jeff Davis Peak at Great Basin National Park, 300 miles northeast of Las Vegas. If the U.S. naming board agrees, the second tallest point in White Pine County’s Snake Range will return to its traditional Shoshone moniker, Doso Doyabi, which means White Mountain." To read more, click here. --A 22-year-old skier tragically died on Summit County's Quandary Peak on Sunday. It appears that Peter Wing fell at the 13,400-foot level of the mountain and then succumbed to his injuries. To read more, click here. --The Aspen Times is reporting that, "A skier and snowboarder had to be rescued from West Willow Creek basin near Snowmass Ski Area after getting lost off the backside of Snowmass Ski Area on Monday. The two men separated after getting lost to try to find their way back in-bounds but were forced to call 911 around 5 p.m. Because the two separated, Mountain Rescue Aspen had to create two search areas and find each man individually." To read more, click here. --On Friday morning, two skiers near the Lindley Hut south of Aspen were washed into the trees in an avalanche. Neither skier was seriously injured. To read more, click here. --Former AAI Guide Kelly Cordes wrote a piece in the New York Times about how gateway towns like Estes Park are doing during the Shutdown. To read the article, click here. --I've often said that the outdoor industry was drowning in alcohol. But it's not just the industry, it's the participants within in. This is an excellent article that raises some very good questions about how we relate alcohol to outdoor pursuits and how it might impact our "healthy lifestyle." The article focuses on the culture in Colorado, but it's my belief that this is a universal thing in the US and Canada outdoor adventure scene. --A father and son snowmobile team were tragically caught in an avalanche in Calgary this week. Both were killed in the slide near Mt. Brewer in the Purcell mountains. To read more, click here. --So an Oklahoma woman bragged about bagging a deer to a game warden on a dating app. It turns out that it was poached...and and easy catch for the warden. To read more, click here. --Gaia, the mapping software company, has several job openings of all sorts. It is an all remote company. To read more, click here. --The Government Shutdown forced a German mountaineer to abandon his solo winter ascent of Denali. Check out a video about this below. To read more, click here. --I've often said that the outdoor industry was drowning in alcohol. But it's not just the industry, it's the participants within in. This is an excellent article that raises some very good questions about how we relate alcohol to outdoor pursuits and how it might impact our "healthy lifestyle." --Outdoor Sportswire is reporting that, "Snowsports Industries America (SIA) announced the launch of United By Winter, a climate advocacy platform for the winter sports industry. The campaign is intended to give SIA members the education and tools to address climate change and it’s impacts on the snow industry." To read more, click here. --The Access Fund is reporting that, "we have strengthened protections for climbing access at two of Austin’s most popular climbing areas—Barton Creek Greenbelt and Bull Creek." To read more, click here.